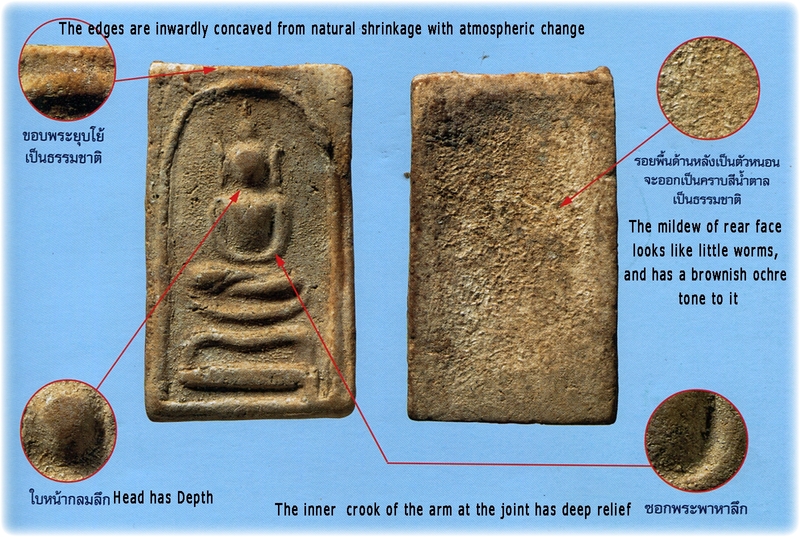 History and Pantheon of amulets made or Blessed by Luang Phu To (Pra Racha Sangwarapimondana), of Wat Pradoo Chimplee. 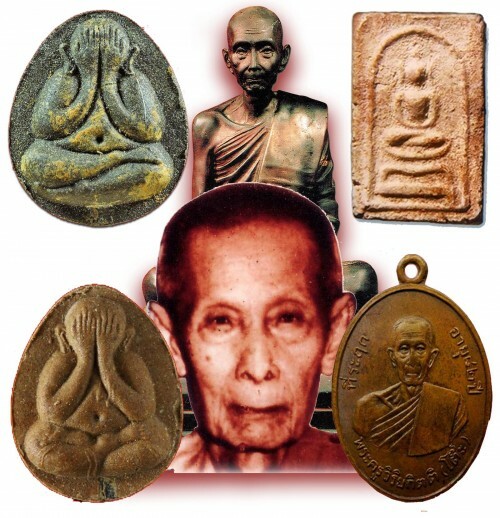 To begin with the correct study and base knowledge of the Pantheon of Pra Niyom preferred amulets of Luang Phu To of Wat Pradoo Chimplee, the first thing one should memorize is the fact that of the first edition of amulets directly made by Luang Phu To, have in total 13 different Pim. Pra Somdej Sam Chan, The Pra Somdej Sam Chan Pim Kha To – a Sacred Powder Buddha Image on a 3 tiered Dais, known as the ‘Table Leg Model’ (Pim Khaa To), the Pra Somdej jet Chan (7 Tiered Dais with Buddha Image), and the Pra Somdej Sam Chan Hoo Bai Sri – a long-eared version of the 3 tiered Dais Buddha Image. These Pim constitute the first edition of Pra Somdej amulet ever released by Luang Phu To. Points of reference for recognition of Phra Somdej Pim Kha To First edition Amulet by Luang Phu To Wat Pradoo Chimplee – click image to view extra large high resolution image for proper study. These 13 Pim, were made by Luang Phu To with the greatest passion and Highest Effort through Pure Intention, and had the intention to make them as Truly powerful as was possible. He spent a long time with much effort to find the rarest, most powerful and sacred herbs, woods and relic ingredients for the Muan Sarn used in the making of the Sacred Powders used for his Amulets. Pra Somdej Kha To Nuea Khaw – study exhibit number 2 – this is an Ongk Kroo Model and therefore the perfect reference for Study click picture above to view in large high resolution for proper study. 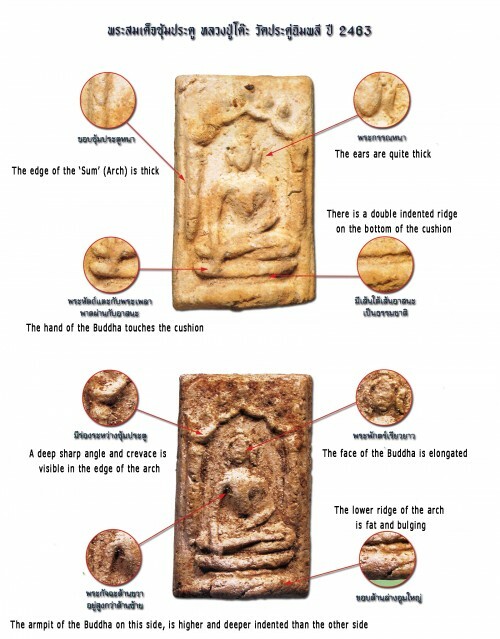 Most of the Pim were pressed by Luang Phu himself with his own hand, but he had help in assembling the Muan Sarn and many menial tasks from the Samaneras and the Lay Masters of Wat Plab temple. This is surely part of the reason that the Amulets of Luang Phu To possess Sacred Powders of Wat Plab in them too. 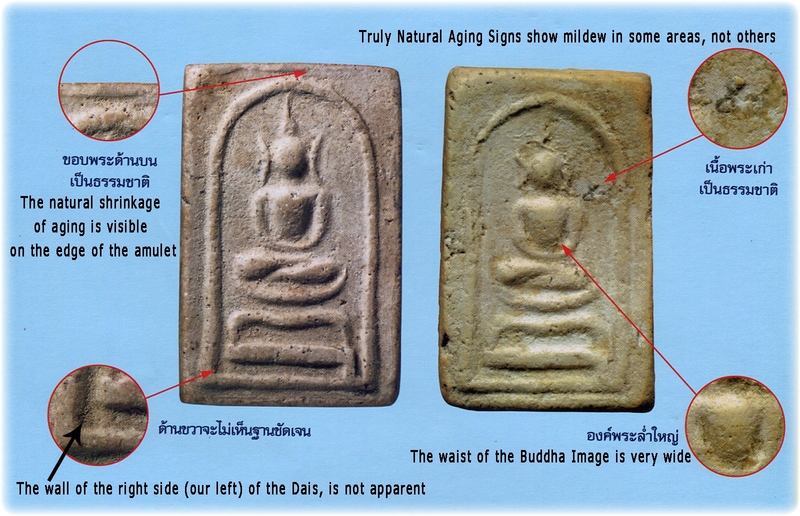 Pra Somdej Hoo Bai Sri Luang Phu To – Wat Pradoo Chimplee exhibit 1 Reference Study – click image to view in extra large high resolution for proper scrutiny. 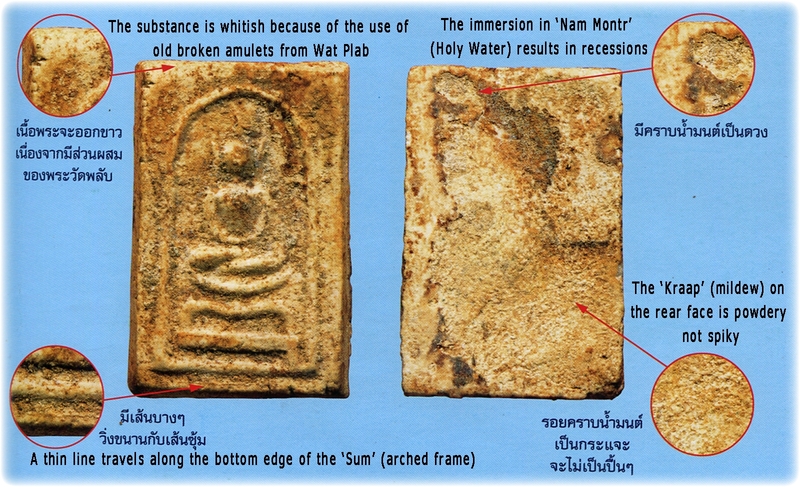 The Great Masters of Wat Plab in Bangkok Yai revealed their secrets to Luang Phu, about the mixing of Muan Sarn. 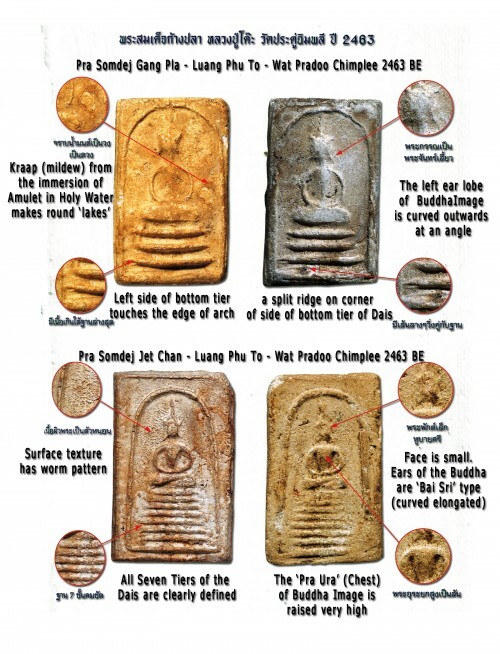 It is a hardly known inner secret, that, all of the Great Masters with great Wicha, passed through Wat Plab, to recieve the Wicha and secrets of the Mastery of the Pra Piti Haa (5 Piti Jhana Control), and the making of ‘Pong Lob’ Sacred Powders, according to the Dtamra Pra Somdej of Ajarn Saeng, who is reputed to have taught the Dtamra of Pra Somdej making to Somdej Pra Puttajarn (Dto_ Prohmrangsri (Wat Rakang Kositaram). Pra Somdej Boo Bai Sri Run Raek (1st edition) 2463 BE – LP To – Wat Pradoo Chimplee – click image to view in large size high resolution for accurate scrutiny and judgement. 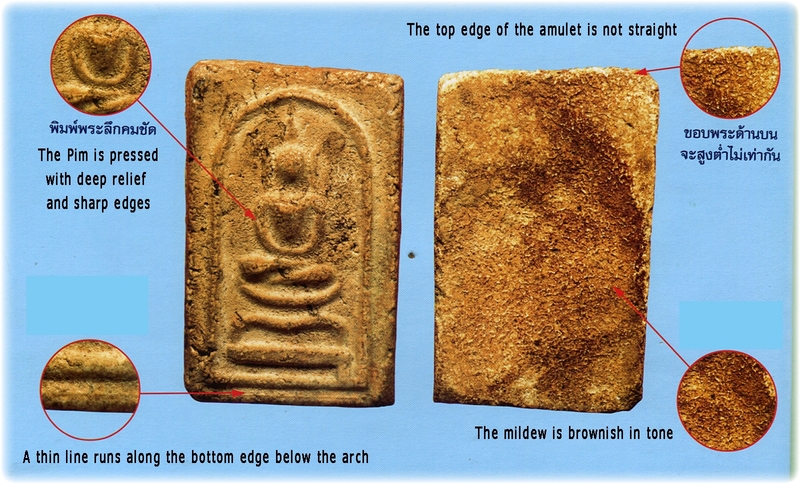 One major base ingredient of the Muan sarn used in this first edition of Luang Phu To’s Amulet Trajectory, was a type of ‘Pong Wised’ (Special powder) or ‘Pong Puttakun), which was colected over many years by Luang Phu To, as he wandered on Forest Tudong. Often he would travel together with Luang Por Sodh (Wat Pak Nam Pasi Jaroen), and another Famous Monk of that time whose name has been lost from all documentation. Pra Somdej Sum Pratu Luang Phu To 1st edition – 2 Pim Ongk Kroo for Scrutiny and Comparison. 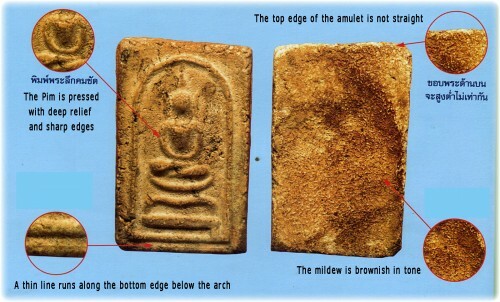 As we can see, color is nor always a way of affirming authenticity, for different Pim, and even different areas of the storage place for the amulets, as well as how the Devotee used, or kept the amulet, can influence much as to how the surface color and appearance is. When he returned back to Wat Chimplee after those Years of Tudong with the Masters, he brought back a large array of Wicha which he had been taught and had Mastered, and made them part of the Dtamra of Wat Pradoo Chimplee. 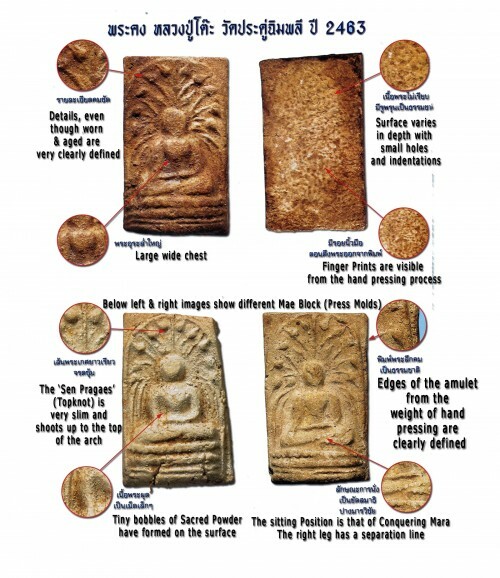 Pra Kong Luang Phu To 2463 BE Pim Niyom First Edition Amulets – Please click picture to view large high resolution for acurate scrutiny, comparison and appreciation. Pra Somdej Gang Pla and Pra Somdej Jet Chan First edition 2463 BE Amulets – LP To two of the thirteen Pim issued in the first edition of 2463. 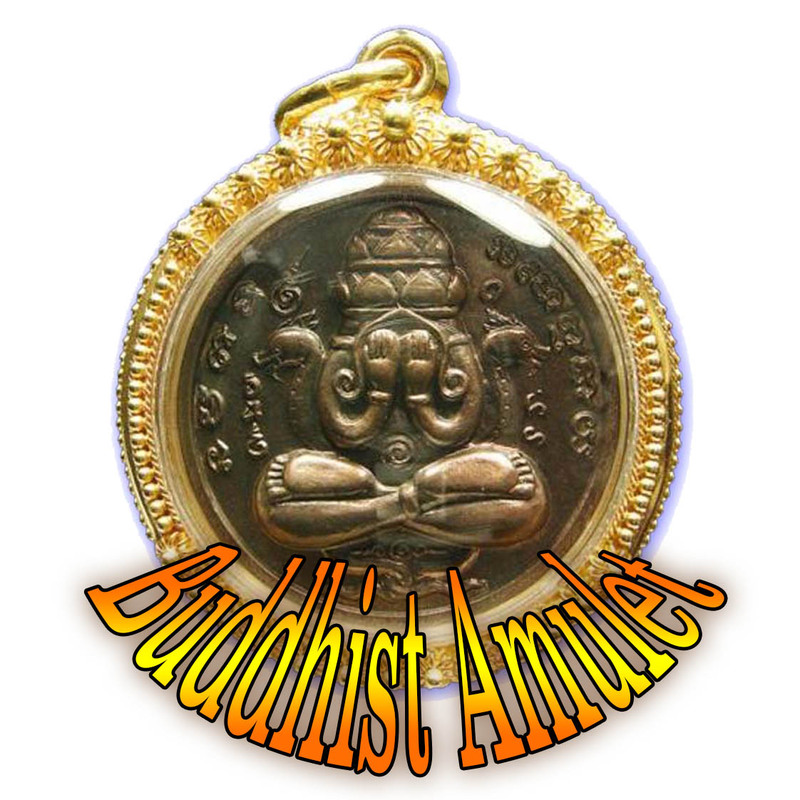 The Dtamra (legend and documentation) of the Thirteen Pim in the first edition, and indeed all other amulets and editions of Luang Phu To, will continue in detail soon.. the story is a long one, and requires much work and time, for which, we expect your appreciation and patience.